How to avoid common problems / mistakes with QR Code to VCards and VCalendars. Share VCards and VCalendars with mobile devices through mobile email or direct download. Mobile VCards and VCalendars are delivered direct from server. Mobile VCards and VCalendars are both trackable calls-to-action. Full analytics are available. 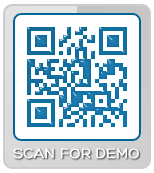 Scan the code to download a mobile VCard and VCalendar.